First small amount of content. 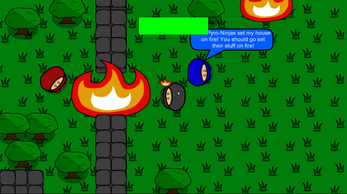 This game would have multiple levels with a powering up system to get better at burning stuff and killing enemies easier and having more health/damage resistance. Made for Shenanijam 2018 hosted by Butterscotch Shenanigans. Used theme Burn it Down. just install it. We used the default game maker 2 windows export. escape pauses. WASD/arrow keys movement, left mouse button/space bar attack.